First-Aid-Product.com: First-Aid-Product.com: Custom First Aid Kits & Custom Label Emergency Kits... Build a Custom First Aid Kit... | OEM / Customized First Aid Kits | First Aid Kits Imprinted with Your Logo & Brand! First-Aid-Product.com: Custom First Aid Kits & Custom Label Emergency Kits... Build a Custom First Aid Kit... | OEM / Customized First Aid Kits | First Aid Kits Imprinted with Your Logo & Brand! Can I have kits Custom Labeled? Yes! Build a first aid kit with your logo imprint! Silk-screen a one, two, or three color custom imprint featuring your logo and message FREE! Promote your Name & Message! Thank Customers & Create New Ones! Why give something away without your name on it? With your Name & Logo, they'll remember your thoughtfulness every time they have a First Aid Need! We can build your own custom first aid kit or cabinet below, or you can add your logo/brand/image FREE to our first aid and CPR kits! Why Personalize an Emergency Medical Kit? 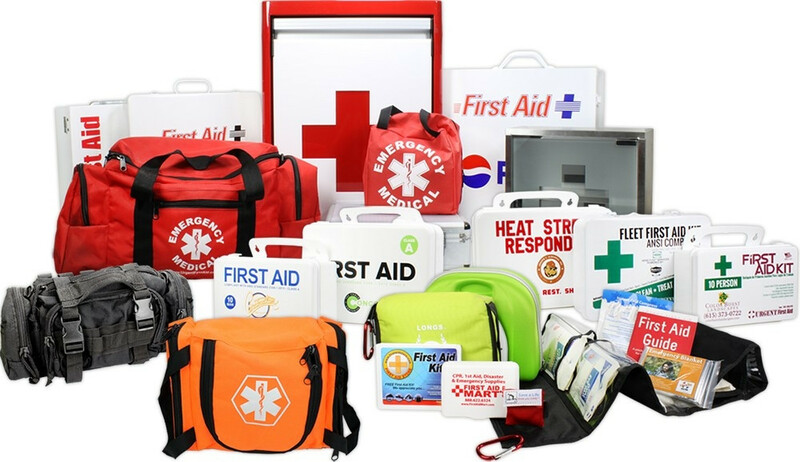 Whether completely custom designed and built to your specifications, or a stock kit we produce branded with your logo or slogan; there are many reasons our clients love our custom first aid kit options. Imprinted personal first aid kits are excellent promotion giveaways that associate your brand with the health and wellness of your customers and employees - they appreciate it when received, and think of you again each time they have a need! If you are selling products in your store or marketplace, building or branding your own unique product will set you apart from the masses. Even if ordering for your organization's safety compliance needs; branded first aid kits in the workplace are less likely to walk off with employees and they promote your message and brand to everyone that sees them. So let us make it special and unique. Most these options are free, our kits are the most affordable on the market, and they are made in USA! Custom First aid Kits? ABSOLUTELY! While we carry hundreds of kits varying in size and content, we also offer completely custom built kits made to your specification (with custom logo Silkscreen, too) which are assembled and labeled by our original equipment manufacturer Production Team right here in the US! If you don’t find a kit on our site that suits your needs, or you would simply prefer to build your own, we would love to quote you the perfect custom kit per your specifications. 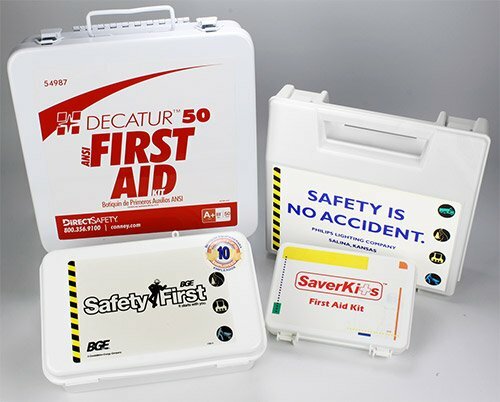 First aid cabinets may be custom built at as few as five (5) units, most First Aid Kits, Emergency Kits, and Disaster/Survival Packs will need to be purchased at a minimum quantity of fifty (50), however, mini kits often have a minimum around one thousand (1,000) for us to be able to do the special build at a price that works for all parties involved. For fastest service use the easy form below to give us the required information so we can build your custom kit quote, or call or email us about this or other custom build projects. Please include all of the information mentioned for Bulk discounts below, and be VERY specific, give us a full content list including sizes and quantities of content, what sort of container you want it assembled in, if you have a "target" price state it, etc. Any images or extra details will help immensely... the more complete you are in your request, the faster you will receive your exclusive emergency first aid kit quote. To get started with your inquiry, we kindly ask that you supply us with as much information and as detailed as possible. The more we have, the quicker we can get your quote to you! Fill in our Custom Kit Build Request Form below so we can work our magic and build your Unique Emergency Kits. Do you have the kit content in a Word Doc or Excel Spreadsheet? Download an example spread sheet. Drag and drop files or click to select. Please convert your items/quantity list into .CSV or .TXT Most spreadsheet programs will allow you to "save as" .csv format & most Word processing programs will allow you to "save as”, txt. You may click the link above to download an example spread sheet, update it with your list, "save as”, csv and then upload. To convert your file, click "file", "save as", and choose "CSV (MS-DOS)"as the "save as type" or "file type". Need just a few Custom First Aid Kits? You can start with an empty metal or plastic kit or a nice first aid bag or first aid pack, then you may continue adding individual items until you have exactly the items you would like in your self-built kit! It's fast & easy! Here are easy links to do it online, and at great discounted prices! Email your question by clicking HERE, or PLEASE call us TOLL FREE (We love talking to our customers!) 6-6 M-F Pacific time / 9-9 M-F Eastern time at 888-228-6694. Greater discounts are available on some items in Bulk. In general, Bulk discounts are already listed for every first aid kit and safety product online - if no discount is listed by quantity, then you may request discounts beginning at a MINIMUM of 250 units ~ smaller items may require larger quantities for "Bulk" Discounts. Click Here for a Bulk Quote! Give us as much information as possible to speed up the process... Who What When Where Why... Who is it for, What Item(s), When do you need the product, Where is it shipping to, Why are you requesting the quote... If it is a bulk quote on a standard item, you will usually receive the quote back within about 24 hours. If it is a custom project / custom build, you will usually receive it within 5 business days. Promote health and fitness at home, on the go, and in the workplace with custom logo and custom built-to-order emergency first aid, safety and health inspired incentives. Your gesture will keep customers, employees, and prospects prepared for medical and other emergencies when you provide custom first aid kits. They are gifts that give twice. Great custom emergency kit options for home or office, add your logo or message to our wide selection of well-stocked first aid kits, disaster survival packs, or roadside emergency bags and kits. Want it specific to your needs? No problem - send us your list and we will quote your own bespoke kit and we will build it right here in the USA cheaper than any custom imported kits sell online or in marketplaces, give away to promote your business, or use it for compliance - we do it all. Wholesale, Discount, Online since 1993! Health and Safety promotional giveaways are a unique incentive idea promoting your business logo as a promotional item, yet marketing your company in the best way possible, associating you with care and being there. Don't get lost in the pile of mailers or tradeshow giveaways. Do something special give something they will keep and use.